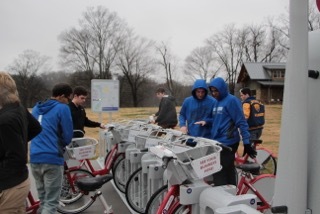 CLARKSVILLE, Tenn. – Thanks to a group of Clarksville Academy students, a grant from the Clarksville-Montgomery County Community Health Foundation and a partnership with the City of Clarksville, two more bike-share stations are coming to Clarksville. 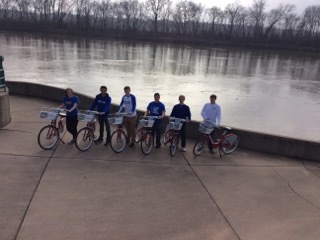 The group of students, researched and wrote a grant proposal as part of Clarksville Academy’s Challenge Based Learning (CBL) for two additional Clarksville BCycle stations. Based on feedback received from community members, the two new stations will be located at the Clarksville Greenway, Pollard Rd Trail head, and downtown at the corner of Public Square and Franklin Street. Stations are expected to be installed this Spring. Similar to the other two stations at Liberty Park and Cumberland Riverwalk, each station will house 10 BCycles. Bikes rented from one station may be returned to any of the other stations. 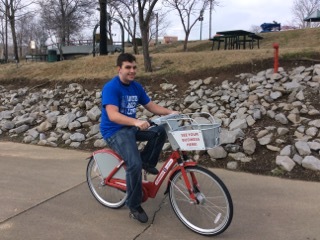 Clarksville BCycle 24 Hour memberships start at $3, and entitle the rider to unlimited 60 minute bike rides. Rides lasting longer than an hour incur $1 usage fee for each additional 30 minutes. Individuals can purchase weekly, monthly, and annual memberships online that allow the rider to skip the kiosk and checkout bikes directly from the dock using the app or personal B-card. 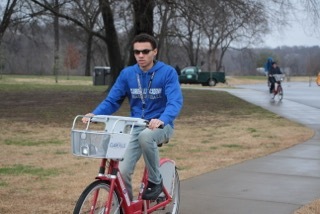 For more information visit Clarksville.BCycle.com or contact Clarksville Parks + Recreation at 931-645-7476. The Challenge Based Learning (CBL) program at Clarksville Academy challenged students with ways in which they could improve their community. The CBL classroom shifts the typical setting in which one instructor teaches set curriculum to multiple students. CBL reverses that model, allowing the challenge to be formulated and investigated, consulting with experts in varying fields as resources, defining guiding questions, and resulting in a sustainable solution all led by the students.